Appearances in Toronto and Brooklyn and Sweden! Good news for all our friends north of the border! 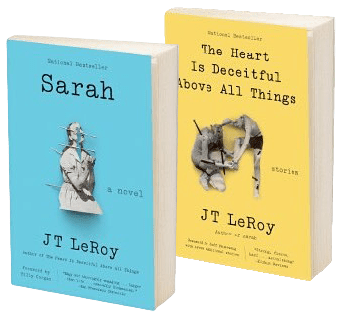 Author: The JT LeRoy Story, currently playing in theaters around the US (find a screening near you by clicking here) will begin playing in Canada in November. The Toronto opening is on November 2 and 3 at the Ted Rogers Cinema (506 Bloor Street W, Bathurst, Toronto; 416-637-3123). As part of the Hot Docs series, Laura will be speaking via Skype at audience Q&As moderated by Hot Docs programmers. She will be talking at the 6:30 and 9:15 screenings on Wednesday the 2nd (yes, that’s her birthday!) and the 6:45 screening on Thursday the 3rd. You can order tickets here. And then what? Well, Laura will be in her hometown of Brooklyn, New York, speaking and signing books at Book Court (163 Court Street; 718-875-3677) on Sunday November 6 at 4 PM. She’ll be joined by Alan Feuer, reporter for The new York Times, author of Over There: From The Bronx To Baghdad, and co-author of Still New York. Introducing Laura and Alan will be novelist Amy Sohn, author of Prospect Park West, Motherland, My Old Man, Run Catch Kiss, and The Actress. For more details, click here. After that, it’s on to Sweden! Laura will be at the Stockholm Film Festival, appearing on November 9 at the 6:00 screening at the Biografen Sture (Birger Jarlsgatan 41A). Tickets can be ordered here. Watch this space for more details!